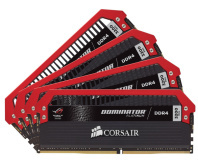 Corsair has unveiled its latest entry into the world of bling-heavy gaming components: the Vengeance LED DDR4 memory range, complete with - as the name suggests - top-mounted LED light bar. Designed to help system builders with windowed or open-air cases draw attention to their rigs, the Corsair Vengeance LED range builds on the company's previous Vengeance designs. Present and correct is the tall and aggressive heatspreader, finished in anodised black, but the design now includes an LED bar running through the fins and the solid central portion in white or red finishes and including a pulse animation mode. 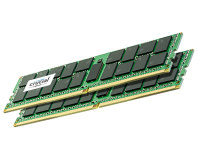 Powered entirely through the DIMM slots, with no need for any external power connection, the Vengeance LED range doesn't skimp on specifications while you're blinded by the light: COrsair has confirmed plans to launch two- and four-module kits from 16GB to 64GB and at frequencies from 2,600MHz and 2,666MHz at 1.2V and 3,000MHz to 4,333MHz at 1.35V. 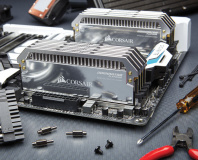 Corsair has begun shipping 2,600MHz to 3,600MHz parts into the channel now, with full availability of the higher speed parts due to begin in the near future. Formal UK pricing has yet to be confirmed.